Before making any aesthetic changes the first thing you will want to do is make sure your newly installed Ubuntu Linux desktop is up-to-date. Using the Ubuntu Linux update-manager to install recommended updates will update applications to their most recent stable versions as well as install any security updates that have been made available since your Ubuntu Linux ISO image was built. Let’s go ahead and do this manually this first time. You will find the Ubuntu Linux update-manager under the System menu (located on the top panel) > Administration > Update Manager. Now that we have the Ubuntu Linux update-manager GUI (graphical user interface) open lets click Check to start the update process. The Ubuntu Linux update-manager will ask you to enter your administrator password while accessing the Ubuntu repositories and retrieving a list of recommended updates for your system. At this point simply click Install Updates and grab a coffee while the update-manager updates your system. Congratulations, your Ubuntu Linux system is now up-to-date! Reboot as required and you will be back at your Ubuntu Linux default desktop. From this point on you will be automatically notified of all available updates, via the notification area, by the Ubuntu Linux update-manager. Before we go ahead and customize your Ubuntu Linux system lets make sure the screen resolution in Ubuntu Linux matches the native screen resolution of your monitor. This is an important step to make sure graphics and fonts appear as intended on your display. If the Ubuntu Linux screen resolution does not match your monitor’s native screen resolution you may be plagued by distorted images and blurry Ubuntu fonts. Most modern LCD monitors have a native resolution of 1600×1200 or higher while laptop screens are often 1440×900. You will have to consult your hardware documentation to verify your monitor’s native resolution. If you do not have your monitors documentation a quick Google search using the monitors model # will usually provide you with the information you need. You can generally locate the monitors model # on the front border or a sticker on the rear. You will find the Ubuntu Linux display preferences under the System menu (located on the top panel) > Preferences > Display. This preference pane is where you will make adjustments to your resolution and refresh rate as needed. You will find the Ubuntu Linux power management preferences button on the screensaver preferences pane. In this day and age power management is particularly important especially when it comes to laptop computers. You will want to make sure you set your computer and your display to sleep after a user-defined period of time to maximize battery life (if you are using a laptop) and minimize power consumption. I generally set my screensaver to activate after 30 minutes, my display to sleep after 45 minutes and my computer to sleep after an hour of inactivity. Feel free to play with these values until you find a power scheme you are happy with. Now that we have all that boring stuff out of the way, let’s see what we can do to personalize your new Ubuntu Linux desktop! Now, for the fun stuff! I will show you how to make some dramatic changes to the overall look-and-feel of your Ubuntu Linux desktop. You will find the Ubuntu Linux appearance preferences under the System menu (located on the top panel) > Preferences > Appearance. This preference pane will allow you to make changes to your theme, background, fonts and turn on visual effects. The theme tab allows you to change your theme, including icons and pointers, to one of the included themes or you have the option of downloading and installing user created themes. The background tab, of course, is where you change your desktop background (wallpaper). The fonts tab is where you can set your default system fonts and, lastly, the visual effects tab is where you turn on some pretty impressive desktop effects. Perhaps my favorite site for getting new themes is the Gnome-Look.Org website. This site is a major hub when it comes to user created themes, fonts, icons sets, mouse pointers, backgrounds, and more. The material is generally well done and the instructions on how to install the various themes is well documented. In most cases you can download the attached archives and drag-and-drop them onto the themes tab for auto-install. Another area where you can really show some personality is in which screensaver you use. The days of blank screen and mystify screensavers have passed! You will find the Ubuntu Linux screensaver preferences under the System menu (located on the top panel) > Preferences >Screensaver. An impressive number of screensavers is installed by default, and like your themes, you can always download user created screensavers should you not find what you are looking for in the default selection. Blank screen, of course, is still available but I encourage you to try screensavers like Helios or Flux for a truly full user experience. Stay tuned! Part four of this series is next. In it we will take a look at what software is included in Ubuntu Linux by default, how to install additional software and my personal choices for must have applications! If you’ve decided to make the switch to one of the world’s most popular Linux distributions (Ubuntu), but are unsure where to start, you’ve come to the right place! 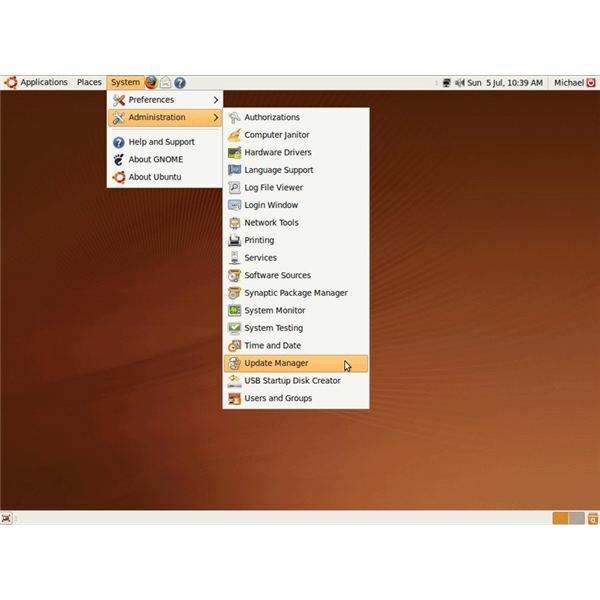 In this guide I will introduce you to the basics of the Ubuntu Linux OS (operating system).